Replacing hinges is fairly easy. When you have three hinges, you can replace them one at a time without taking the door off. Before you replace them, make sure that adjustment or lubrications won't fix the problem. See the articles 'Adjusting an Interior Door' and 'Adjusting Exterior Doors' for information on adjusting the hinges without replacing them. Also see, 'Lubricating Door Hinges' to see if you can get them working again. Make sure you have the same size hinges and style of hinges before you try to replace them. See the article 'Types of Door Hinges' for more information. Remove the screws for one of the hinges on both the door and the frame. Turn the new hinge with the head of the pin turned up. Make sure the hinge folds together the same way as the door will close. Put the hinge in place and install the screws. When the wood is worn, you may need to use a larger diameter or longer screw. Repeat this process for all three hinges, one at a time. For two hinges, the procedure is similar, except you may want to take the door down and replace the hinges in halves. One half attaches to the frame and then the other half to the door. Use the old hinges as a guide. The top hinge needs slightly different treatment. You may or may not have found a long screw in the top hinge. The long screw is usually on an inner hole and goes through into the wood framing for the jamb. See Step Four for more information on the top hinge. You want to put a long screw in, regardless of whether the old hinge had one. The long screw will not come with the replacement hinges, you will have to purchase it separately. A 2 1/2" #7 or #8 shanked screw with a wood thread is ideal. What door hinge installation means should be clarified. Replacing exising hinges is one possibility and installing hinges on a replacement door slab is a different job. Most new doors are sold in a pre-hung format. The hinges are installed at the factory when the door is assembled. When you replace a door slab in an existing frame, you may have to mortise the hinges into the door. This involves laying out and chiseling. A bit more work. This article is focused on repair situations that involve a door hinge installation. Remodeling projects and home improvements may also involve door hinges. Can you replace door hinges in your home when you need to? The answer is yes. Even when you have to do some chiseling, the job is not that hard. What Can You Save? - A new set of hinges will run between $10 and $30 for residential grade hinges. Spring loaded and decorator hinges will run more. Replacing a pair of same size hinges will run between $50 and $75. A custom installation where the door has to be taken down and mortised will run around $100 to $150. How Hard Could It Be? - Replacing the same size hinges on an existing door is fairly easy and can take less than a half an hour. Installing new hinges or hinges that are a different size will require 'mortising' (chiseling) door and frame to get them to fit. For and explanation of the terms in this section, see 'How to Use This Site'. Check the Simple Things! - Lubricating sticking or squeaky door hinges is the simplest thing. 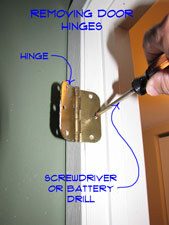 See the article 'Fixing Squeaky Door Hinges', for information. What Can Go Wrong? -Hinges need to be oriented a certain way. Installing them incorrectly will cause the door not to work. Taking a door down and not completing the task will leave you with a big hole in your wall. This could be critical for an exterior or bathroom door. Hinges need to be aligned properly on both the door and frame. Even a small difference can make it difficult or impossible to install the door. Can you mortise a door frame with a chisel for a door hinge installation? Yes you can. Do you really want to? Probably not. You may have the unfortunate situation of having to buy hinges that are a different size than the old ones. You may need to widen the mortise where the hinge is seated. When you are engaged in a door hinge replacement project you want to maintain a point of reference on the door and the frame. Leave one side of the mortise for the hinges intact on both the door and the frame. Your best choice would be the top of the hinge. Remove the old hinges and use a new hinge as a template. Hold the hinge snuggly against the mortise at the top of the old hinges. Take a sharp pencil and draw an outline of the hinge on the door frame. You will repeat this process for all the hinges, always keeping the hinge aligned with the top of the old location. Most residential doors have two or three hinges. Does this mean that they have an equal share in the work? The answer to that question is No! The other hinges are there mostly to act as guides when the door opens. They keep it straight while it swings. The top hinge carries the majority of the weight of the door. For a door hinge installation, you need to pay special attention to the top hinge. The door frame needs to be properly supported behind the top hinge. Most door manufacturers recommend that a long screw be used for the top hinge. This screw goes into the wood framework for the door. Over time a door will start to sag. When the sagging gets bad enough the door won't close properly. When this happens, look to the top hinge first. A long screw back into the door jamb can work wonders for a sagging door. 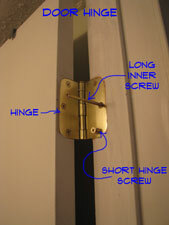 For a door hinge installation, you want to make sure you install a long #8 screw in the top hinge. Usually 2 1/2" long will work. Go easy when you put this screw in, you can pull the door frame in too far. The long screw should go into one the inner holes on the hinge, to make sure it hits the stud for the jamb. So how did your door hinge installation project go? Hopefully, you were able to find replacement hinges that were the same size and style as the ones you had. This makes the job a lot easier. Searching for exact matches can be hard when you have an old door. They can also get expensive. Did you have to try to fit hinges that were a different size? You may have had to do a little chiseling to get the mortise to work. If you were careful this should have worked fine. Now that you are done with your door hinge installation project, you can think about other home repair jobs you have been putting off.